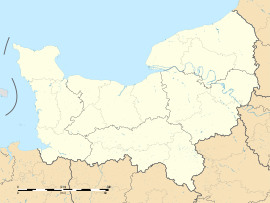 Bihorel is a commune of the Seine-Maritime department in the Normandy region in northern France. 1 January 2012 is started to merge with Bois-Guillaume, but the merge was cancelled in January 2014. Bihorel is a suburban and light industrial town forming part of the conglomeration of Rouen. the Chapter: the residential neighborhood further north. Bihorel is situated at the junction of the D243 and the D443 roads. The T2 line (TEOR) permits to reach the city center of Rouen in 30 minutes from the south of Bihorel. The F2, 40 and 20 lines make possible to go to the city center of Rouen in 10 minutes. Gules, a bend sinister between in chief a beehive and in base 2 leopards Or, and on a chief azure a knight contourny between an archer contourny and 2 soccer players contourny the sinister one with a ball at his foot, Or. The town was created on April 13, 1892. Previously, Bihorel was a district of Bois-Guillaume. On 4 July 2011, the merger of Bihorel and Bois-Guillaume was voted in the municipal council, a merger that has been effective since January 1, 2012, under the regime of the new municipalities, despite the consultation organized by the mayors of these two cities. There was a very large opposition from the population (66.43% opposed). From January 1, 2012 to December 31, 2013, the municipality was merged with its neighbor, Bois-Guillaume, under the new municipalities to be Bois-Guillaume-Bihorel. The creation of this commune was invalidated by the administrative court of Rouen, a decision against which neither the prefecture nor the municipality appealed. The two municipalities are therefore recreated on 1st January 2014. A seventeenth century manor house. Jules Michelet (1798–1874) historian, stayed here many times. Charles Nicolle (1866–1936) scientist, had a house here. Wikimedia Commons has media related to Bihorel. This page was last edited on 15 June 2018, at 12:33 (UTC).